If you are thinking of hosting a hackathon—and if you’re reading this, there is a good chance you are—the first question you should ask yourself is “Why”? It’s not just the first question. It’s the also the most important question you need to answer before taking any other steps. There are a lot of good reasons to host a hackathon (and just as many horrible reasons, but that’s for another blog) and when we look back on the 150+ innovation-focused events including hackathons in 125 locations, we see that the (good) reasons generally fall into one of six objectives: Community Creation, Developer Engagement, Recruiting, Innovation, IP Development or Branding. At a higher level, these objectives can be further classified as either participant-focused (Community Creation, Developer Engagement and Recruiting), or output-focused (Innovation and IP Development). Branding can be either participant- or output-focused; whichever is more likely to help achieve your company’s unique objectives. It may sound overwrought, but determining your primary objective is critical to the success of your hackathon. 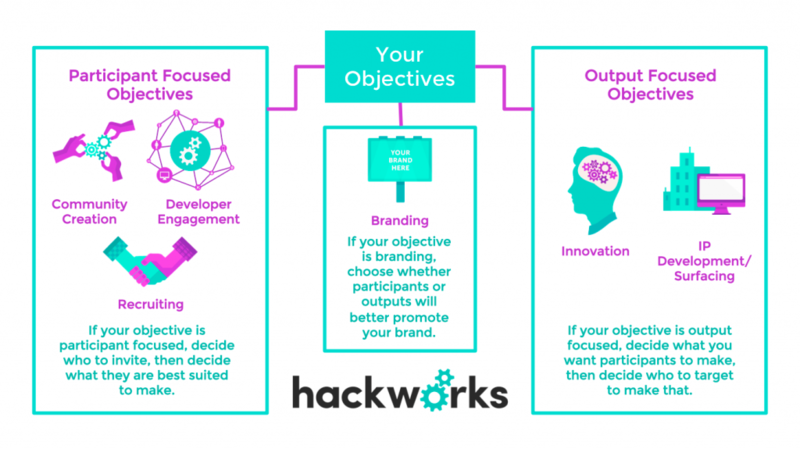 If your objective is people-focused, then determine who the people are you want to engage with and build the best hackathon to suit them and meet their needs. Choose a venue that is convenient for them to access. Choose a theme they can be passionate about. Design a demo format (live pitching or expo-style) that is conducive to the personality of your participants. And incentivize participants in a way that is meaningful to them (Money? A job? Fame?). If your objective is output-focused, then determine what the outputs you want are, and invite the right people to make it happen. Do you want working prototypes of medical devices? You will need both engineers and healthcare specialists. Do you want solutions that can help fix traffic issues? You may need data scientists and policy experts in addition to your coders. It seems simple, but in so many instances we see hackathons where things are just done backward—choosing the venue first, or picking a theme, or even deciding what food to serve—without giving due consideration to the objectives. When we are planning a hackathon, either one of our own or for a client, we are constantly checking our decisions along the way against our key objectives. Hackathons provide an opportunity to activate a tech-savvy community to rally around a specific cause. A good example of this type of hackathon is Gift the Code, a hackathon we recently ran on behalf of Capital One. Gift the Code invited the Toronto tech community to rally around the needs of six local charities and code solutions to their challenges. The results of the hackathon were impressive. But even more outstanding was the desire of the participants to keep working on the projects once the hackathon was over and see them implemented. Hackathons present an excellent opportunity to expose a community of developers to new technologies. It’s a great way to seed developers with new or in-development hardware or software, ask them to dig into it and try it out. For companies looking to grow their teams, hackathons provide an opportunity to look beyond a resume in identifying interesting potential employees. Depending on the theme of the hackathon, just showing up can identify someone that shares a common passion with your organization. And in the span of a hackathon weekend you are likely to see the full range of experiences an employee can face in the working environment—code that won’t compile, finding out a competing team has a similar idea, re-thinking and eventually releasing the product to the world. How well they deal with the highs and lows in the context of a hackathon can act as a proxy to how well they will deal with these types of challenges on the job. Whether you are looking at hosting a public hackathon or an internal one just for employees or members of your organization, the framework of a hackathon is a great way to surface, develop or identify new IP. It was during an internal hackathon that the team at XMG Studio identified a unique gaming mechanic that ended up being at the core of a series of games it later released. A hackathon provides a risk-free environment to crack a specific challenge or simply leave room for spontaneous brilliance. Hackathons are where those with the passion and abilities to problem-solve, build something out of nothing. But in their day job, most developers are looking to minimize risk, so they stick with tried and true software, hardware and processes, which can stagnate innovation. In a hackathon, the risk of failure is minimal or nonexistent and participants are encouraged to forget all of the regulations, restrictions and reservations they are often seeped in and instead be free to experiment, envision and exercise their innovative freedom. And finally, hackathons are a fantastic vehicle to position its hosts and sponsors as corporate changemakers by demonstrating honest investment in the social coding movement. So get out there and get hacking, folks. Don't miss out on any of our upcoming events! Sign-up for the newsletter below to stay in touch.